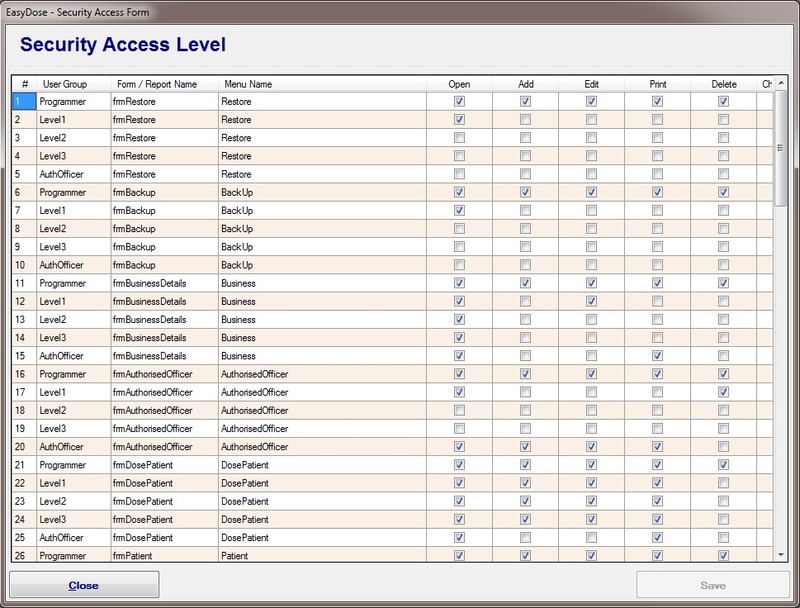 EasyDose access is protected by Logon security and by periodic logon prompt which is triggered by inactivity. Passwords are encrypted and cannot be viewed at any time. Manual Login, unlocking EasyDose and Dosing Verification, where the User Name & Password is required, can be replaced with even greater security by adding a Bio-Metric Readers (Fingerprint scanners) to EasyDose. In addition, sensitive forms are closed after a period of inactivity, e.g. dose patient closes after 2 minutes of inactivity while the easyDose program locks after 5 minutes of inactivity. Sensitive forms, setup forms, programmers forms and Health Department Inspector orms have built in security as well as security controlled by Level 1 Administrators. This will ensure the integrity of the system and prevent accidental or unauthorised changes to the system. Security Settings Form used by Level 1 Administrators. This is for advanced users only. If in doubt please call support for advice. If authorised, settings can be customised to suit an individual stores’ preferences. Add or remove a tick from a form/function to either grant or deny the permission/access to a particular form or function. The ‘Save’ button will enable. Click ‘Save‘ and ‘Close‘ the form. NOTE 1: As stated above, some forms have built in security and cannot be changed or overridden from this form. NOTE 2: Even though the security has a Delete column, no data can ever be deleted in EasyDose. It is a Health Department requirement that there is no functionality to do so.